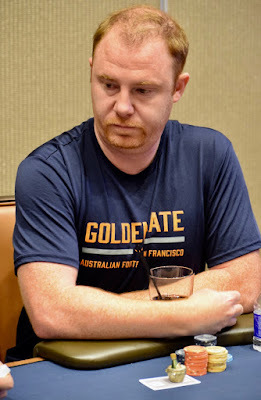 Mike Lancaster moves all in over a 12,000 bet from his challenger on the turn and it takes quite a while for his challenger to decide whether to add the 20,000 more it takes to call. The board is and Lancaster does get a call. He turns over for top boat but his challenger is not drawing dead. The challenger shows for one out to a straight flush. The river ... ... quads for Lancaster.